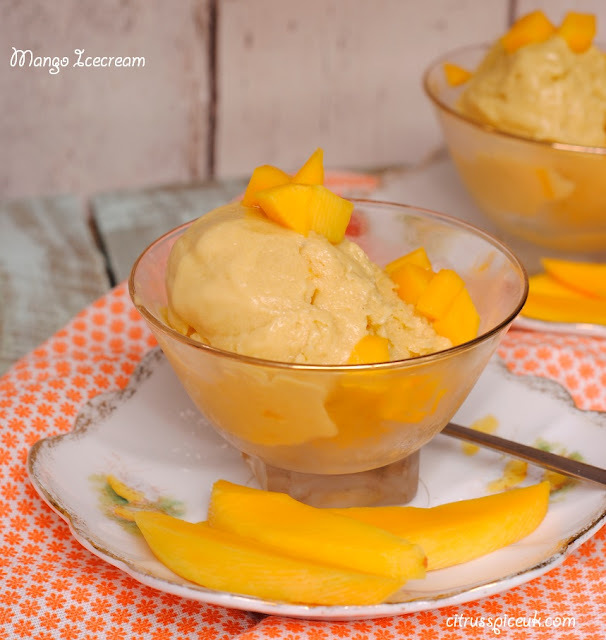 This delicious guilt free mango ice cream is dairy and sugar free too. 1. Peel 2 of the mangoes and remove the stone and finely chop them into cubes. Put in a ziplock bag in the freezer overnight.2. Peel the bananas and break them into chunks, place them in a ziplock bag in the freezer overnight.3. To make the ice cream add the frozen bananas and frozen mango into the Optimum 9400 blender and blend both ingredients until totally smooth and creamy.4. Add the coconut cream and the mango essence and blend for another minute till mixture is thick and creamy.5. Transfer the mixture to a tupperware pot and cover with lid and place it into the freezer for 3 hours.6. After three hours take the tupperware out of the freezer and using a fork stir the ice cream through to break up any ice crystals. Smooth the surface and return to freezer for another 3 hours.7. To serve the icecream remove tupperware from freezer and leave at room temperature for 5 minutes.8. Peel the remaining mango and remove the stone and finely dice it. 9. Stir in the mango pieces into the ice cream and scoop ice cream into serving bowls. I made my Mango Ice cream in the The Optimum 9400 blender which was sent to me by Froothie to try out, you can see the original review here. 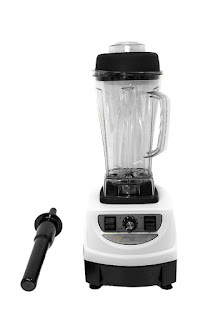 The Optimum 9400 not only makes amazing smoothies, it, blends, pulses, grates, chops, grinds. makes cold icecreams and even cooks hot soup. It is available to buy at £349.00, It comes with a 1 MONTH TRIAL - MONEY BACK GUARANTEE (includes return postage costs for UK customers) You can also get an extra two year warranty if you order through this site using code "Brand Ambassador" If you like the sound of this awesome blender, please orders it through here. We are trying to eat more dairy free at the moment, so this sounds like a lovely dessert for is to try. I love mango too! This is a lovely recipe with coconut milk.. I love mangoes and will definitely make it when they are in season. I didn't realise it would be this simple to create such an exotic ice cream! Thanks for sharing the recipe. that looks delicious - more of a gelato than ice cream. This sounds like a dish of sunshine! I love my Froothie blender for whizzing up this sort of healthy dessert. I'll have to try this one soon. This looks yummy! I love the flavour of mango. So summery. How can I make this without the machine? Just stir by hand? Optimum 9400 is very powerful and crushes frozen fruit or ice. If you have a normal blender don't freeze the fruit beforehand , make the ice cream with fresh fruit , the freezing time will be longer but you will get same results. This sounds absolutely delicious! It reminds me that summer is hopefully coming one day soon... I've pinned it for then! 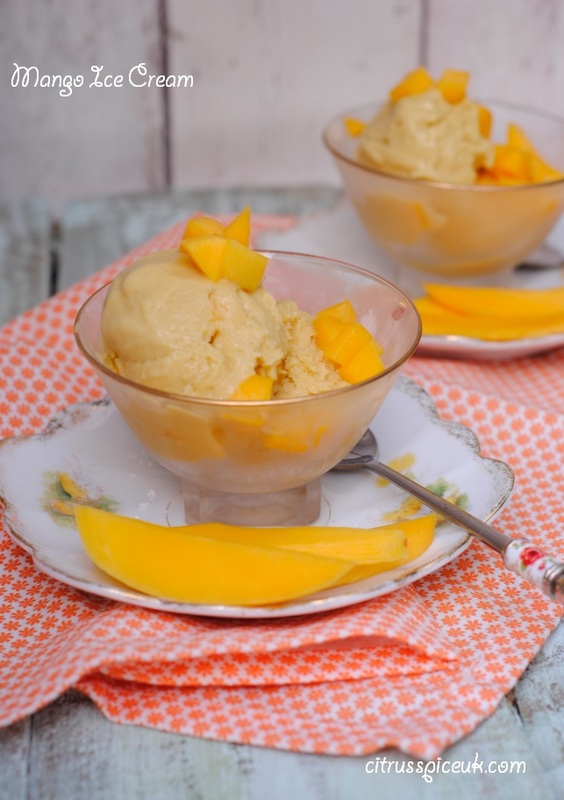 I love the flavour of mango and like that this is a 'healthy' ice cream recipe - no guilt! Nayna, such a yummy looking icecream. I have tried out banana ice cream without any dairy products. Love the idea of adding mangoes. I love mango and this looks so easy to make, providing you can wait for the freezing time. I love ice creams and mango - a winner recipe this one! Ooh, this sounds so good! Must give it a try - pinning now! Sonia you can swap the mango with any fruit like peaches, strawberries or mixed berries , you can also omit additional fruit and just add melted chocolate with cocoa to make chocolate ice cream. The options are endless. ooh, bananas and mango - what a delectable combination! I've never made ice cream before. Really must give it a try some time. oh wow!! this sounds amazing!!! must make some of this!! Thus sounds amazing! I've never seen mango essence before. I'll have to look out for it. This sounds amazing! Like most people I love ice cream.i've never tried this flavour though. Sounds delicious, mango and icecream - what a great combination! This sounds delicious. I never knew how simple it would be to make. Another delicious recipe from you I love mango ice cream and I like that it is dairy free because dairy can sometimes affect my IBS. Loving the combination here. Sounds so yummy and refreshing. It looks so easy to make! We would love it in this house, we love mangoes! I love making fruit sorbets and ice creams using the blender, just lobbing in beautiful frozen fruit and coconut milk for the ice cream version. So good! Oh how fabulous, this looks super easy too. We love mango here and we definitely need to start making ice-cream that's for sure. This looks amazing and so easy to make! My son is lactose-intolerant so I'll definitely be trying this! I love how easy the Froothie makes this. I've just done something similar with kiwi and banana! Adore mango too so imagine this tastes awesome!